The industry sees a clear need for innovation in pipeline technology and new ways of monitoring pipelines. To drastically speed up and simplify pipeline operators’ decision-making, DNV GL is launching the Pipeline Evaluation Portal. This will make DNV GL’s own models and tools easily available to customers through a web browser. A DNV GL survey of 723 senior professionals worldwide shows that 61% believe most pipeline failures could be avoided by investments in new technologies and 67% say the oil and gas industry needs a new way of monitoring pipelines. 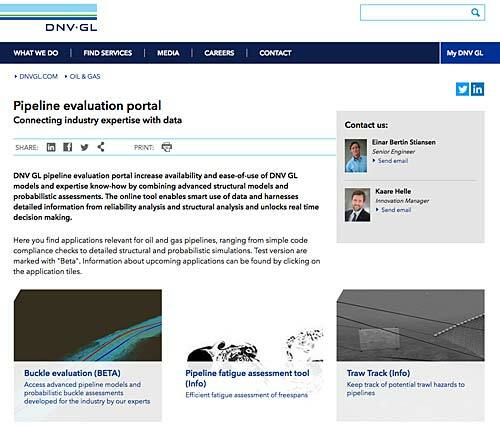 DNV GL’s Pipeline Evaluation Portal aims to address these issues. It will increase the availability and ease-of-use of DNV GL models and expertise by combining advanced structural models and probabilistic assessments with subject matter expertise. Through the DNV GL database (containing element analyses and a problem specific Bayesian network) the user will be able to perform “what if” analyses directly in the web browser – in real time – by adjusting the operational parameters, and get an immediate response. This will speed up, simplify and unlock decision-making. The new Pipeline Evaluation Portal will host a growing number of applications that enable the smart use of data and harness detailed information from reliability and structural analyses. The first application ready for testing in the portal demonstrates how a DNV GL model for pipeline lateral buckling can be provided in a way that allows user interactivity to support decision-making. DNV GL invites the industry to test the application and share experience or feedback. Upcoming applications range from fatigue assessments to trawl tracking and from corrosion analytics to anchor hooking data management, and will be launched in the portal over time. Each year, DNV GL creates cross-disciplinary, international project teams with 6-8 participants to carry out extraordinary innovation projects over a four-month period. These projects explore a speciﬁc ﬁeld of technology or draft a new innovative concept to be tested in the market. This year’s projects have resulted in a prototype for a real-time lateral buckling model that can be provided in a way that allows the user to interactively support the decision-making.